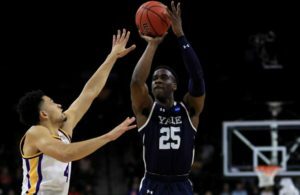 Miye Oni’s 31 points led Yale past Dartmouth in New Hampshire. 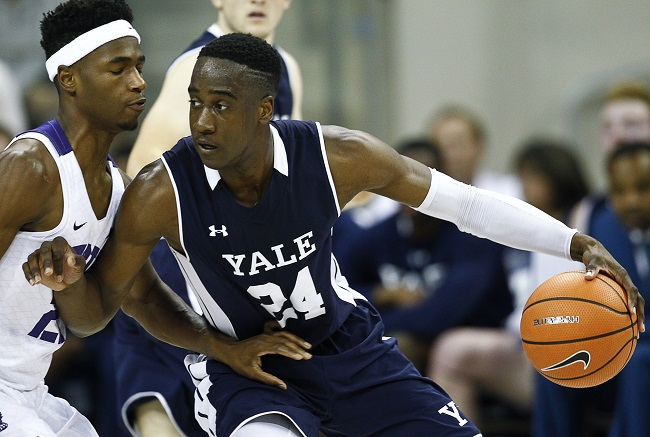 After being stymied at Harvard the night before, Yale (13-4, 3-1 Ivy) moved further north to Hanover, N.H. and cruised past Dartmouth (10-10, 1-3 Ivy) 89-68, in Leede Arena. Junior pro prospect Miye Oni’s had a career high 31 points. He was 10 for 16 total shots, including 4 of 6 from 3-point range and seven of eight free throws. He also pulled down nine rebounds and had four assists and two steals. Blake Reynolds and Jordan Bruner had 17 each. Reynolds had a perfect night making all seven of his shots and three 3s. Dartmouth was reasonably close at the half, trailing by 10. But Yale came back with a run of nine after the break. Fourteen players got into the game for Yale, and ten of them scored. Chris Knight led the Big Green with 20 points and eight rebounds. 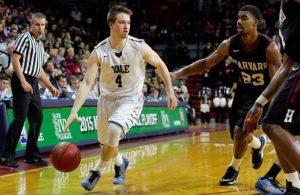 Harvard completed a perfect and fairly easy home weekend, following its win over Yale, by beating Brown, 68-47. The Crimson and Yale are now tied for second place (3-1) behind undefeated Princeton (4-0). All three teams, Harvard, Yale and Princeton won on Saturday. Bryce Aiken, gradually returning to form after an injury caused absence, scored 12 points for the Crimson and three others had 10 each. Harvard led 30-24 at halftime, but Brown, which shot only 29 percent, helped the Crimson pull away. Backup guard George Mawanda-Kalema led the Bears (13-7, 1-3) with 14 points off the bench. 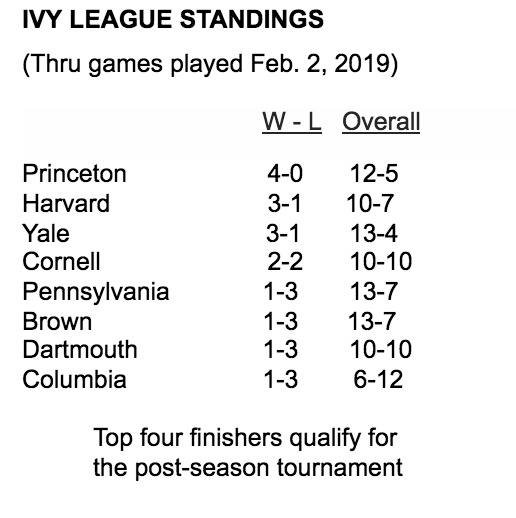 Princeton, still the only undefeated team in the Ivy League, completed a successful weekend without suspended star Devin Cannady, but needed overtime to win at Cornell, 70-61. The Big Red, trailing by eight at the half, managed to catch up and take a one point lead, 51-50, with 7:02 showing. Then, with the Tigers ahead 56-54, Cornell’s Josh Warren made two free throws with 18 seconds left. Princeton (12-5, 4-0 Ivy) missed two potential game winners, and regulation ended tied. Richmond Aririguzoh scored 20 points on 6 of 6 from the field and 8 of 10 foul shots for the Tigers, who won their seventh straight. Warren and Matt Morgan scored 16 each to lead Cornell (10-10, 2-2). 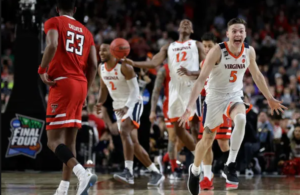 Pennsylvania, with great success outside the conference, finally won in the Ivy League on Saturday, but it wasn’t easy. Columbia took the home contest down to the wire before the Quakers eked out a 72-70 decision. To do so, Penn had to repel a last second effort by Columbia star Gabe Stefanini, whose fade away bounced off the rim. Penn became the last team to win a game in the well balanced league. Its usual high scorer, AJ Brodeur, had 24 points and Devon Goodman added 19. But Penn had no answer for Stefanini, who led both teams with 27 points. The first half included a pair of scoring runs by each team, Columbia for 10 points and Penn 12. The Quakers led 32-31 after 20 minutes, and the game stayed close to the end.